If I was to teach a class today, and the issue of climate change came up, we would pretty much agree that deforestation and “global warming” are new problems that surfaced in recent decades. These impacts upon our environment can lead to increased health problems due to pollution in the atmosphere, the presence of ozone in the upper atmosphere, the negative ecological impacts of overharvesting, and a number of environmentalist gaia theories. This is still the common argument used to define global warming today. But what about Global Cooling? We like to blame industry for much of the melting of the polar ice caps that scientists feel may be happening today. Still, this claim for the cause of global warming is very different from a similar theory developed 75 years earlier by Noah Webster. To put Webster’s theory in modern terms, I like call it–the Theory of Global Cooling due to Deforestation. Webster claimed that by eliminating all of the larger trees and reducing the forests to prairies and grasslands, that we are in effect making it easier for the weather to make all of us sicker. Once the winter winds began to blow, we’d have no natural cover to the prevailing seasonally cyclic wind and storm patterns. This meant that some places might soon get colder and others much warmer, either of which were no longer be healthy for us to reside in. What a set back for the goals of world explorers and entrepreneurs for the time! So just how did Webster’s theory of Global Cooling come about? He published his theory as a direct argument against Rev. 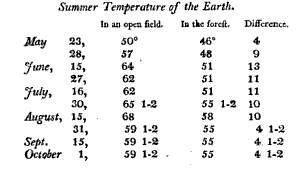 Dr. Samuel Williams’ theory on local climate changes proposed in 1791 and references in his book The History of Vermont. The reason Webster had taken such an interest in William’s writings related to his own areas at the time. Webster was very much interested in the relationship between climate and disease, in particualr epidemic diseases. Yellow fever at the time was considered by many to be the next plague for New York, Philadelphia, and other rapidly growing urban settings. Due to the recurring nature of this plague, it was speculated by many to be God’s choice, and most had the logic needed to back up their individual philosophies about this reason for the recuring epidemics. In 1800, Noah Webster published his three-volume book on the geography of epidemic diseases called A Brief History of Epidemic and Pestilential Diseases. His focus was mostly on the epidemic diseases for the time, but especially yellow fever. Since no one knew at the time that yellow fever was transmitted by mosquitoes, the theories for this condition being proposed were numerous. Webster took the approach that any devoted reader and writer of dictionaries would take–he read all the books and wrote extensively about them, providing most of the details of their independent stories. To most physicians, the observations at the time indicated that this disease tended to erupt near large stagnant water bodies. At times these water sources for the disease were speculated to be swamps, the polluted waters at the north end of Manhattan Island (Thomas Paine’s favorite theory), the smelly ballast water being poured out from beneath the ship as it went to set dock, the still and slow flowing waterways in the poor areas at the edge of the city. In 1807, a detailed article on trade winds, weather and health was published in The Medical Repository, the medical journal published in New York City, called “An ESSAY on the TEMPERATURE of the SEASONS indifferent years, and on the Course of the WINDS, particularly upon the Atlantic Ocean in the Northern Temperate Zone, and the Countries adjoining that Ocean. By MARK LEAVENWORTH, Esq. Written in France, 1807, and communicated for the Medical Repository by SAMUEL RUSSEL, Esq.” [Medical Repository, 1807, vol. 12.] In this article, the author suggested that ocean and atmospheric circulation were important predictors of the health of a region. This supported Noah Webster’s study of epidemic diseases, especially the plagues that traversed the globe, in which he came to the conclusion that climate was the cause for many of the worst epidemics in global history. When Webster published these claims in his book, he was not immediately supported by large numbers of doctors. But over time, as the yellow fever continued to return approximately every three years, this made some people change their point of view of urban life. This change in attitude in turn led a number of entrepreneurs to follow suit with Webster’s claims by marketing their real estate for sale based upon some of Webster’s claims about disease and climate. They used this marketing strategy to promote the mid-Hudson valley as a very healthy location to live. In 1810, Noah Webster apparently wasn’t satisfied with how the people responded to his claims about disease and climate. Everyone believed that climate and weather had a lot to do with how and why we became ill at certain times of the year, getting the influenza during the fall and winter months, experiencing more dysentery during the hot and humid month. But no one was really willing to go all the way with Webster’s claims about the values of landscape in preventing the world from becoming more disease prone. So Noah Webster gave another talk on his weather based theory for disease, in his neighborhood at the Connecticut Academy of Arts and Sciences. The vibrations of the temperature of the air, are more considerable; but it is an unquestionable fact that they are much greater in an open country, than in a forest; and so far is it from truth, that the clearing and cultivation of our country, has moderated the rigour of our cold weather, that the cold of our winters, though less steady, has been most sensibly increased. Webster later added more complexity to this theory of global climate change. Both warming and cooling were possible, depending upon the region under review. But one thing was certain according to Webster–it was the deforestation of heavily forested regions that no doubt was leading to the increased winds and much colder winters many of the more settled parts of the world were then experiencing. The rest of this article that follows, speaks for itself. Like the statement that Columbus wasn’t the first to “discover” North America (we all know it was Leif Erickson, or perhaps one of the Hawaiians lost at sea), recent scientists, even from 50 to 75 years ago, weren’t the first to worry about global warming and global cooling. Once again, Noah Webster put his name out front in the calendar of history books pertaining to this particular aspect of medical geography, early American epidemiology and environmental health. The following is Noah Webster’s article on his version of the deforestation and global cooling theory, conceived probably in 1798, and presented and published in 1799 at the Connecticut Academy of Arts and Sciences. A short follow-up to the original speech presented in the memoirs was composed around 1806 or 1807. This entire work was published in 1810. Memoirs of the Connecticut Academy of Arts and Sciences* Vol. 1, part 1. New-Haven, 8vo, 1810, pp. 216— Steele & Co.
LONG since have we noticed, in our Reviews, the publications of the associations upon the plan of the present, in New-York, Massachusetts, and Pennsylvania. We now congratulate Connecticut, in having laid before the public a collection of tracts, written by some of her literary and scientific sons. The project for an institution which might unite the exertions of literary persons in Connecticut, for the promotion of useful knowledge, was formed in 1799. The first meetings were held in New-Haven.— The society was organized; rules were adopted for its government; and lastly, an act of incorporation was obtained from the legislature, during the autumnal sessions of that year. The academy, so constituted, holds an annual meeting, on the fourth Tuesday of October, for the choice of its officers, and stated meetings on the corresponding days of December, February, April, June, and August; that is, it meets six times in a year, or once in two months. A leading and favourite object with the founders, was to collect for publication a statistical account of Connecticut. For this purpose various measures have been concerted. Though this desirable end is not yet accomplished, we understand it is progressing, and that nearly thirty communications have been received in answer to the circular letter of inquiry sent forth in January, 1800. But the chief objects of the academy are of much wider extent ; being directed to every method of improving the sciences, arts, and happiness of their country, so far as the general state of its concerns, and their own leisure, would permit. The book now before us is the first publication of the united labours of these academicians. The memoirs are seventeen in number. Four of them are from the hand of Noah Webster, junior, Esquire. These are the following: 1. A dissertation on the supposed change in the temperature of winter. In this he combats the popular and fashionable opinion, that the winter temperature in northern latitudes has undergone a material change, so that it has become warmer in modern, than it had been in ancient times. The argument is principally directed against the doctrine of Mr. Williams, the historian of Vermont. It is conducted with learned research and much ability. From an extensive and detailed inquiry into the facts, as they occur in Palestine, Italy, Constantinople, and the vicinity of the Black Sea, the Alps, Gaul, Greece, Spain, and Germany, Mr. Webster seems inclined to believe that nature is remarkably uniform in her operations; and such remarkable changes, as some persons have pretended, have, in reality, never taken place in the northern hemisphere. He presumes that the opinion of the increasing mildness of the winter, has arisen from the acceptation of the accounts of a few severe winters, as descriptions of ordinary ones ; and from a proneness to draw general conclusions from particular facts. After an examination of the historical documents of Europe, Mr. Webster proceeds to inquire into those of America: and after a laborious and serious search into the authorities extant, he concludes that neither Kalm, Smith, Lahontan, Wood, Winthrop, Winslow, Higgeson, nor others, have afforded any solid reason to conclude that the seasons are, on the whole, milder than they formerly used to be. We insert the conclusions themselves, which the author deduces from his erudite and laboured investigations. ” It appears to me extremely unphilosophical to suppose any considerable change in the annual heat or cold of a particular country. We have no reason to suppose that the inclination of the earth’s axis to the plane of its orbit, has ever been varied; but strong evidence to the contrary. If this inclination has always been the same, it follows that the quantity of the solar rays, falling annually on a particular country, must have always been the same. Should these data be admitted, we are led to conclude that the general temperature of every climate, from the creation to this day, has been the same, subject only to small annual variations, from the positions of the planets in regard to the earth, or the operations of the element of fire in the globe and its atmosphere. ” The real truth seems to be, that when a country is covered with forest, the vibrations in the temperature of the air and of the earth near the surface, are less numerous, and less considerable, than in an open country. Dr. Williams himself has furnished the data by which to determine this point. In 1791, he found an open field froze to the depth of three feet five inches; at the same time, in a forest, he found the temperature of the earth, to be 39° by Fahrenheit, seven degrees above frost. This fact solves the question here discussed. ” From these observations, it results that in winter the earth of the forest is seven degrees warmer than the open field; and in summer, it is, on an average, from May 23 to August 31, 91-4 degrees colder—and on an average, from May 23 to October 1, 8 1-4 degrees colder. That is, the vibrations in the forest temperature of the earth are between 39° and 58°—only 19 degrees of difference between winter and summer—while the vibrations in the temperature of the open country, are between 32, or frost, and 68—making a difference of 36° between winter and summer. ” The vibrations of the temperature of the air, are more considerable; but it is an unquestionable fact that they are much greater in an open country, than in a forest; and so far is it from truth, that the clearing and cultivation of our country, has moderated the rigour of our cold weather, that the cold of our winters, though less steady, has been most sensibly increased. There is not a greater amount of cold during the winter, but the cold at times is more severe than before our country was cleared. The difference is so sensible, as to be a subject of popular remark among aged people. ” Another effect of clearing the country, is, to distribute the cold of the year more unequally: hence fruits are more exposed to spring frosts. This is a most serious inconvenience in Europe, and is becoming so in America. The reason of variable and late springs is obvious. While the earth is covered with wood, it is never froze, but as soon as the snow is dissolved in spring, vegetation begins. In an open country, after the’ snow is melted, the earth is to be thawed; and the heat of the air, for two or three weeks, is incessantly absorbed by the earth and water, while the frost is dissolving. Hence the heat of a warm day in spring is speedily absorbed, and cold succeeds. This alternation must continue, till the earth is warmed. If the winter temperature of the earth in a forest is 39°, and that of the open country 32°, we may easily conceive what an immense quantity of heat it must require to raise the temperature of the open field to that of the forest. It must demand nearly all the heat excited by the solar rays in April, so that in our open country, the earth is probably not warmer on the last of that month, than it was, when a forest, on the first of the month. ” It will be remarked that in discussing this question, I have admitted the fact assumed by my opposers, that there has been a clearing and cultivation of Palestine, since the settlement of the Jews in that country ; and of Italy, since the days of Julius Caesar. But I must not quit the subject, without contradicting the fact assumed. The reverse is the truth. ” When Joshua led the Israelites towards Palestine, that country was very populous, inhabited by various tribes of people, and containing large cities, whose enormous walls terrified the Israelites. Never has that country been so populous as in the few first centuries, after the Israelites took possession of it. The country therefore could not have been covered with wood, but every foot of cultivable land was occupied by husbandmen. ” Equally true is it, that the countries on the north of Syria were as populous in the days of Darius, as at any subsequent period. It was the case also in Italy, which was more populous at the Christian era, than it has been for the last fifteen centuries. In all these countries, therefore, no clearing of the lands can have taken place, to influence the climates, within the period in which a moderation of cold is supposed. Germany, on the north of Italy, has been, in a degree, cleared; but the Rhetian Alps intervene between Italy and Germany; and the cold winds which affect Italy in winter, blow from those high lands, where the air is colder than in the less hilly country on the north. In every point, therefore, the hypothesis of a moderation of climate appears to be unsupported. ” I would only further observe, that if the cold has abated ten or twelve degrees in our climate, within a century and a half, it must have been intolerable before that period. The mean temperature of Vermont now, is about 43°. If we deduct 10° only for abatement of cold, the water in deep wells in Vermont, two hundred years ago, must have been of 33° of temperature, or nearly at the freezing point; in Canada it must have been at 32°, or the state of congelation. If we suppose the winter only to have changed, and deduct one half the supposed abatement, still the result forbids us to believe the hypothesis. If we suppose the heat of summer to have lessened in the same proportion, as just philosophy requires us to do, the summers formerly must have been intolerable; no animal could have subsisted under ten degrees of heat beyond our present summer temperature. On whichever side we turn our eyes, we meet with insurmountable difficulties.